Brent is a sought-after performer, studio musician, and teacher, who is best known for his unique guitar style. Brent studied under Jazz legend Joe Settlemires. At 17 he had the privilege of opening up for the famous classical guitarist Edgar Cruz. Other well-known artists he has performed with are: Merle Haggard’s guitarist, Clint Strong; Tony Stampley; the Finger Picking Virtuoso Richard Smith; Cowboy Troy; Kevin Fowler; Micky & the Motorcars; and many more. Brent has spent his life traveling wherever his music leads him. He has enjoyed being a part of local bands such as: Nathan Burris, Jake Bowers Band, The Tipsy Hicks, Folk Sing Bright, The Devin Derrick Band, Rick Jawnsun & The Backroad Symphony, Jonathon Escoe and the Drifters Calling, and many more. 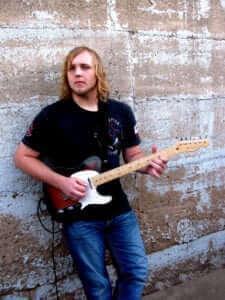 Currently he plays lead guitar for Cowboy Troy from Big & Rich, and is the lead Vocalist/Guitarist for Strung, where he has performed in venues such as the 2008 Wildlife Expo in Guthrie, Oklahoma, The Ranch in Midland Texas, Cowboys in Albuquerque New Mexico, and Venues in Las Vegas and Nashville as well as many others.